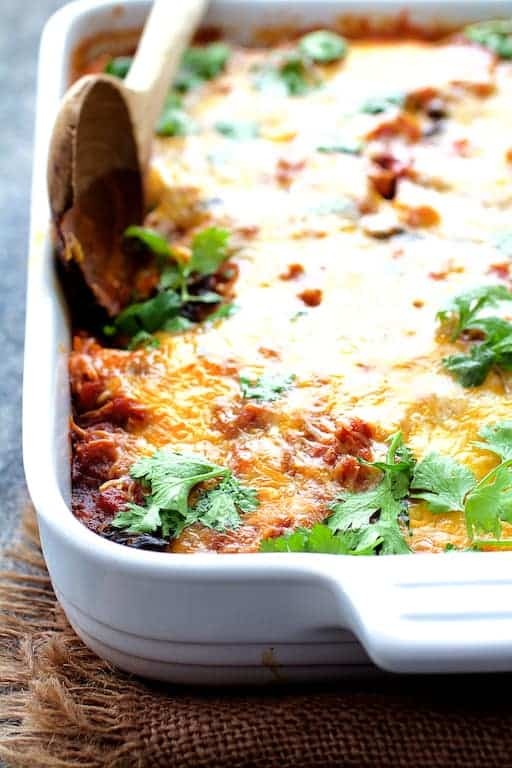 Mexican Chicken, Poblano and Black Bean Tortilla Casserole is cheesy, easy and perfect for a cold winter night! We finally put our garden to rest a couple of weeks ago. I know… Hard to believe that at the end of November anyone is still reaping produce from a garden but we really didn’t have a hard frost until then. So, this weekend I was doing a little refrigerator assessment and realized we still had a huge bag of our home-grown Poblanos sitting in there. They’d been in there a couple of weeks so it was time to skedaddle and do something with them! It’s amazing how long something lasts that is homegrown and not shipped in from some far corner of the globe! I roasted and peeled them all, froze about half and with the cold wind blowing outside, decided a good, spicy Mexican-inspired casserole with chicken was in order. Yeah, baby! 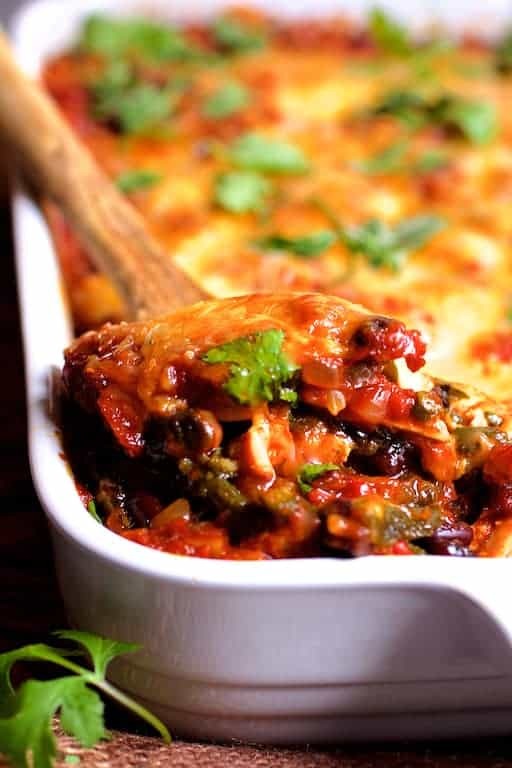 This Mexican Chicken Poblano and Black Bean Tortilla Casserole! So why roast Poblano peppers you may ask. Well, the skin of mature Poblanos can be a bit leathery. Here’s more information on how to roast Poblano peppers. I think it bumps up the flavor tremendously! 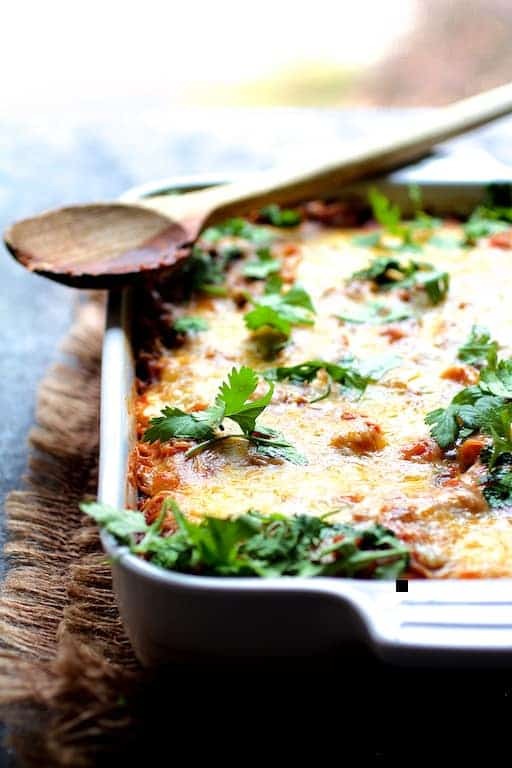 The most difficult part of this casserole is frying the tortillas. The reason you want to fry them up first is because they’re going to hold up better in a casserole. 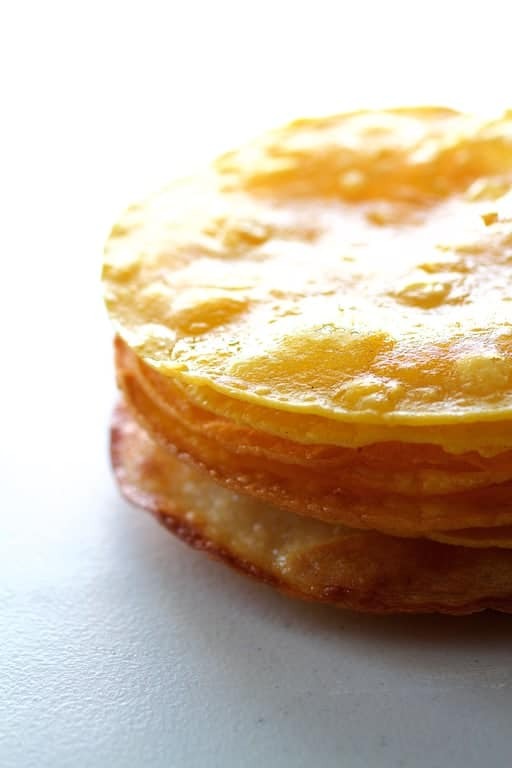 Corn tortillas placed directly into a casserole tend to dissolve. All they need is one to two minutes in hot oil and they’re good to go! Simply drain on a cooling rack and they’re done! Layer the ingredients, refrigerate and this casserole is the perfect make-ahead dish. Assemble it up to one to two days ahead of when you’re going to need it. Some cilantro on the top and some sour cream on the side. Yes! You have the perfect dinner for a chilly winter night! MAKE AHEAD: Can be made 1 day in advance. Cool and refrigerate. Let sit at room temperature 30 minutes before placing in a hot oven. You may need to increase baking time. FREEZER-FRIENDLY: Assemble and cool thoroughly. Wrap and freeze up to 3 months. Thaw in the refrigerator then let sit at room temperature 30 minutes before placing in a hot oven. You may need to increase baking time. I made this as written (ok, used a hoppy, fruity IPA) and it was amazing. Had a few Santitas handy to chase around the loose bits on the plate… nothing was left over. Thanks, David! So glad you enjoyed! Would Hatch chilies work in place of the poblanos? 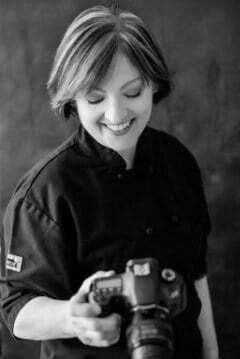 Hi, Dianne, Thanks so much for your question. I think they would. The thing I like about the Poblanos is that deep, smoky flavor they give the dish. Hope you enjoy and let me know how it goes. Yaaaas! This looks so stinking good. And I know for a fact the whole family will go nuts over it- totally trying this soon! Poblanos are one of my favorite peppers – this looks delicious! That looks delicious! 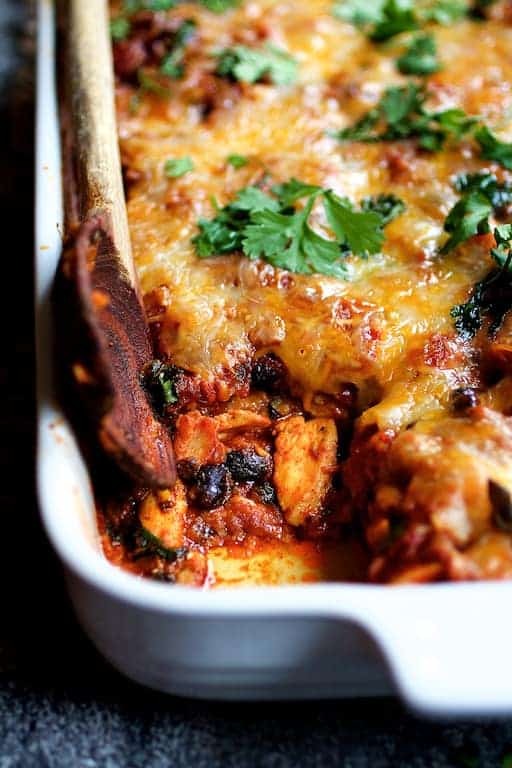 I’d personally sub the chicken for something else since i’m vegetarian but oh my tortilla casserole sounds amazing! Thanks, Veronika! You could do tofu or do two different types of beans…. Add more veggies, etc. It’s very adaptable! Oh my gosh that looks so good! I would eat that right now and it’s 7:30 am in the morning. I never new that about frying the tortillas first. Can’t wait to try this! This looks so delicious! I’m in love with poblanos. And I don’t have a garden, but I still have peppers (and one lone tomato) from out last CSA pickup. (We didn’t have a frost until last week.) Local and really fresh – they do last so much longer! Yes! Homegrown produce is so much better tasting. Looking forward to the growing season for that reason! This looks so good! And I know what you mean about the homegrown produce lasting longer. It’s amazing! Thanks, Anne! It’s crazy how long it lasts!